The Gart Sports name has been synonymous with the top tier of sporting goods retailers in the United States for decades. The Gart tradition started in 1928, when Denver Post newspaper carrier Nathan Gart started the company with $50 in fishing rod samples. 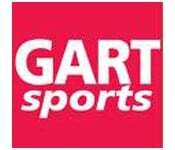 Gart Sports, which also operated Oshman’s and Sportmart, completed a “merger of equals” with Sports Authority on August 4, 2003.